The NEUSPEED hi-flow downpipe is all stainless steel: flange, pipe and flex joint! We improved on the factory design by eliminating the "S" bend and enlarging the pipe to 60mm. Professional installation is required. Your stock downpipe is welded to the catalytic converter. 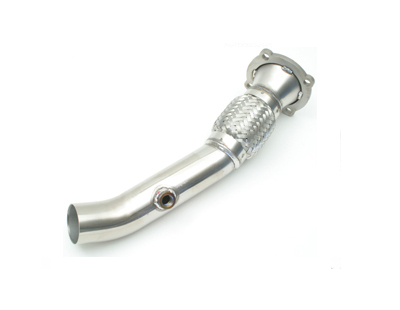 To install the NEUSPEED downpipe, your muffler shop will need to cut the old downpipe just in front of the catalyst and weld the NEUSPEED downpipe in place. The other end of the NEUSPEED downpipe simply bolts to the turbocharger. A new exhaust gasket is included.